Risotto is a pretty awesome rice dish. The truth, though, is that I would probably never make it if I had to make it the traditional way, which involves stirring, and an abundance of time. Luckily I have two devices that will make risotto for me: my Zojirushi Rice Cooker and my Instant Pot. The latter has become my favorite as of late because it is oh so fast. 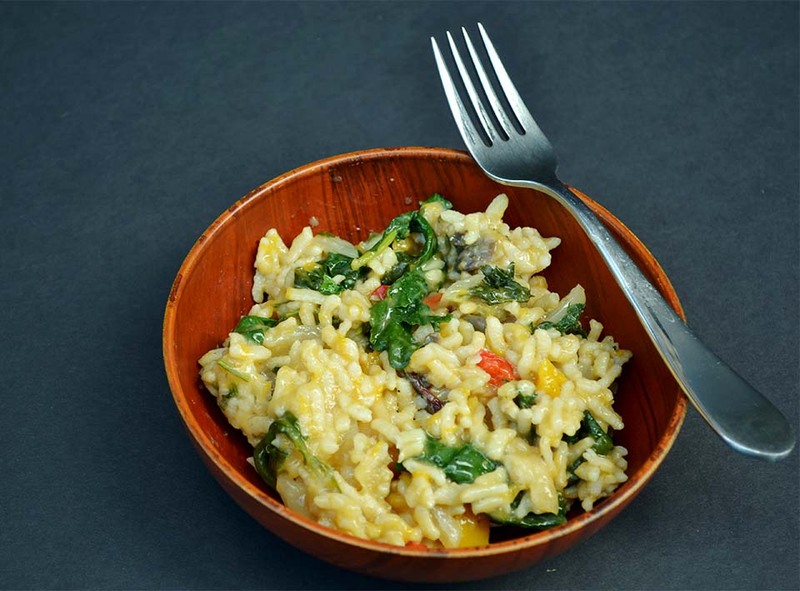 Risotto in 15 minutes, almost completely hands off? < It can do that. 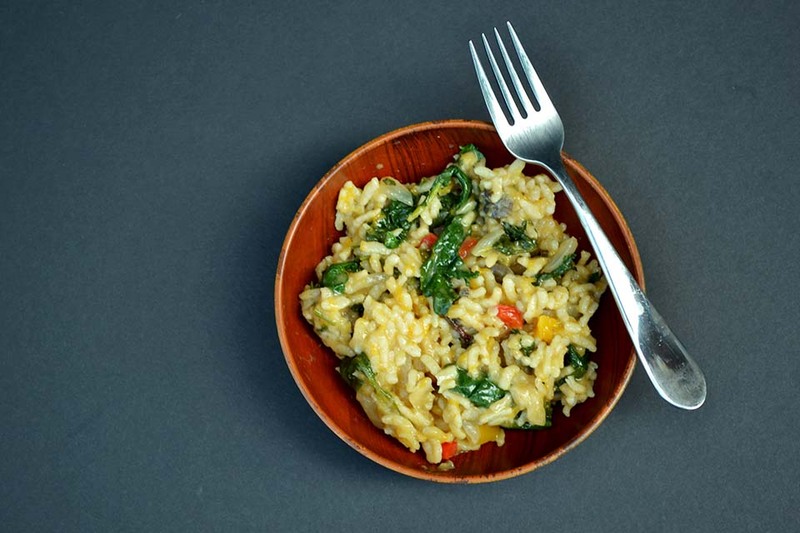 My go to – typical risotto recipe is my Mushroom Risotto, which I first started making in the rice cooker before I had the Instant Pot. I make it a lot. So much, in fact, that I decided it needed a bit of a change. And – with summer here to stay, I figured some nice CSA vegetables would go nicely into a risotto. 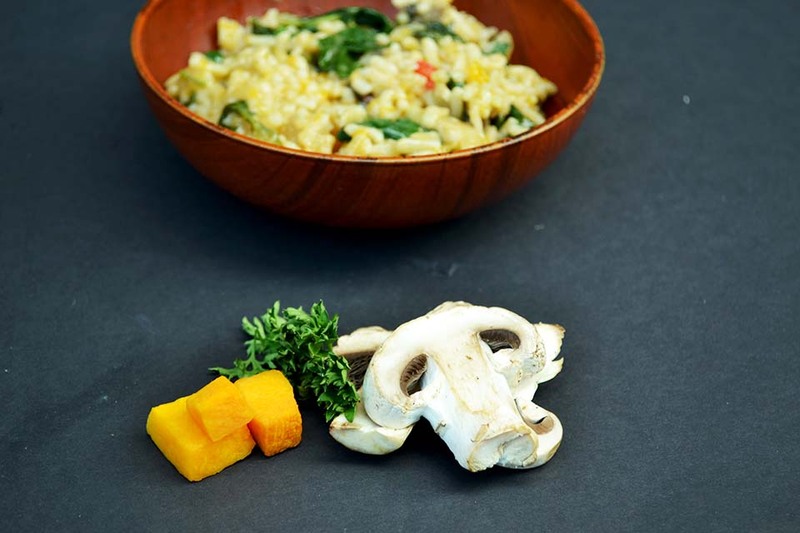 I chose butternut squash in this risotto because … well, it’s what I had in the fridge. I also am seriously in love with how perfectly the Instant Pot cooks the butternut squash. < for real…as you’ll see again next week. You can really use this as a base and switch the vegetables out however you’d like. Arboria rice is a special kind of short grain rice. It’s known for being firm and creamy. It also blends well with just about any flavor you throw at it. I especially enjoy it for it’s creamy consistency – since a dairy-free-world is often a creamy-consistency-free-world. This type of rice should be available at most grocery stores – although the store I frequent didn’t carry it. Any other type of rice won’t make ‘risotto’ in this recipe. So, are you ready to make a wicked fast dinner? Let’s hop to it. Transfer into a serving bowl and stir in: greens, parsley and nutritional yeast and black pepper. Stir well. It will thicken after a few minutes. Add the vegetable broth, wine, mushrooms, salt, black pepper, coriander and oregano and stir well. I shared this recipe on GFE’s gluten free Wednesday. Click here for other Gluten Free Recipes. ← Total Shameless Plug… < New Earrings on my Etsy Shop! I have just about the same rice cooker! Do you use the standard white rice setting or the porridge setting? I’ve always used the standard setting!! It’s a wonderful rice maker!! We had this for dinner tonight and it was WONDERFUL. I chopped up two small butternut squash- so I did use more than 2 cups of squash. Cooked it in my Instant Pot. Amazing. Will be making this again. Thank you! Awesome, Sue! I am so glad you liked it! Thank you for letting me know! Hello! About to try this in my Instant Pot – do you think I can safely double the recipe? Not sure if you’ve tried it yet! It’d be close with how much the rice expands, but I’d love to hear how it turns out if you do! YAY! I am so glad you’re enjoying it!!!!! When you say “Coriander” do you mean the herb leaf/cilantro or ground coriander dried spice? Thanks! Thanks! I suddenly had the worry that you might be in the UK! Could you use frozen butternut squash? If so how would you adjust cooking time etc… ? Thanks! Frozen should work just fine. I would leave the cook time the same, to make sure the rice cooks through. You don’t have to worry about t hawing the squash – however – it may take a bit longer to come to pressure at first, since some of the ingredients are cold! Is there a viable substitute for the nutritional yeast? Nutritional Yeast gives the dish a cheesy texture/flavor but it’s not necessary if you don’t want to use it. If you eat diary, you could add some Parmesan cheese instead. I meant to put Parmesan on it after I made it, and forgot. Honestly it’s delicious without the yeast or the cheese. 🙂 Excellent recipe. I made it for lunch (working from home) because I wanted something healthier and with lots of veggies. I use ground cashews for nutritional yeast. Hi, I just got my Instant Pot and I’m wondering about the cooking time given here — does click manual and reduce the time to five minutes mean that it only takes five minutes to cook? Or does Manual set a certain amount of time and then you just reduce by five minutes? Apologies if this is a stupid question. Thanks so much for your help — looking forward to making this! When you click the manual button (depending on your model) it will usually start at 30 minutes. You’ll click the ‘ – ‘ button to reduce this to 5 minutes. Loved this! Thanks for the recipe. Didn’t have mushrooms or red peppers, and it turned out great just the same. Everyone should buy an instant pot just to cook this amazing recipe. We LOVED it. Topped it with feta at the table rather than adding the yeast or topping with Parmesan. Family raved about it! I can’t believe that risotto is so easy! Could you make it with brown rice, and would it need to cook longer? Brown rice and arborio rice work totally differently 🙁 The arborio rice creates a very creamy texture, where brown rice would be dry here. You could sub it out and change cooking times – but the consistency of the dish would not be creamy. There is brown arborio rice around. Works great, cook longer than white arborio rice. Oh cool! I’ve never seen that. I’ll have to keep an eye out for it! LOVED IT!!! My family doesn’t care for mushrooms so I added more squash. This is a keeper. Didn’t miss the fat or cheese in this fantastic risotto. Thank you. YAY! I am so glad you liked it!! Thank you for letting me know!! Hi. Thank you so much for posting this dish. I was very excited to find a vegan risotto recipe, especially for the instant pot. However, just want to say, this certainly did not take me 15 minutes. Maybe there could have been 15 – 20 minutes in the pot, but from start to stop I look me 90 minutes. I know I am not the fastest, but how long did it really take you to make this? Interesting! I am a super speedy cooker 😀 It didn’t take me log at all to chop the veg and throw everything in! But perhaps add a few minutes for that, yes! The best part is it is hands off once it is in the pot! No more stirring for hours! Oh my goodness, this recipe is phenomenally delicious! Mum and I wanted to make risotto to use a pumpkin we had sitting in the fridge and this recipe gave us everything we had hoped for. We used the pressure cooker method, best ever! We subbed 1tsp ground sage in place of coriander and oregano. We mixed through baby spinach leaves as the greens. We added toasted pine nuts and cherry tomatoes at the end and sprinkled with shallots to serve. Oh wow!!! That sounds AMAZING!!!!!!! YAY! I am so glad you enjoyed it!!! OUTSTANDING. I’m a new vegan with an omnivore hubby and kiddos, so it’s been a challenge to find “family dinner” vegan recipes that everyone likes. I made white bean pot pie that got the following comments – “This is great, but it would be better with chicken.” Usually no matter what I make, vegan or not, one kid will love it, the other will hate it. They will eat anything because they know I’m not a short order cook and refuse to make a second meal if they don’t like something, but the grumbling is, well, frustrating. So I tried this risotto in my Instant Pot – with a couple small changes. Mine had no mushrooms and I substituted fresh thyme instead of oregano because it was what I had handy. Also, I chopped up some shelled pistachio nuts to sprinkle on top for extra crunch/protein. This was sooooo good. My kids devoured it (not a grain left on their plates) and were excited to get it in their thermoses for lunch the next day. THANK YOU! Wow!! This totally made my day!!! 😀 I am so glad that they loved it!! Your additions sound awesome – pistachios – what a great idea! The cool thing about this recipe is that you can also switch it up – feel free to add other veggies for a variety of dishes 😀 It sounds like your family is giving this a good shot – which is awesome. You’re doing amazing things for your health – keep it up! So easy to make and perfect for a cold day! I got an instant pot for Christmas and this was the first recipe I made. So delicious! I’m so glad you liked it! Welcome to the instant pot! So excited to try this for a vegan friend and pair with some baked garlic Parmesan chicken for the no vegans. Just wondering how many people you would say this recipe serves? Thanks! Hmm it depends on if this is a main dish or a side dish. I could get several bowls out of it myself! This was the first dish I made in my new Instant Pot. it was really delicious! Re-starting my plant-based eating and I am already looking forward to the next time I make it. Thanks for sharing your recipe! I don’t keep dry white wine around in my pantry – is it really needed or can something else substitute for it? Hmm you could probably just omit it. Adding a small amount of rice vinegar may help too. Made this last night and it is SO good! This is the first grain or pasta I have made in the Instant Pot. I was really skeptical about whether I’d achieve the proper texture and consistency by not doing it the old-school way. I am so happy that this turned out as good as it did! I left out the coriander and oregano by choice, so I think the next time I make this maybe I’ll add a little sage and maybe more pepper to pep it up. Thank you for a great recipe! And thank you to everyone who gave a review prior to me cooking this – you were my inspiration to give it a try! Hmm I do not – I’m sorry! I don’t track these 🙂 I am glad you all liked it! Can the arborist be done in the instant pot too? Can everything be done together? Thanks!! Yep! It is all done together! Arborio… my phone doesn’t know cuisine! This is so good and one of my new favorite recipes for my Instant Pot – thank you! We reduced the black pepper by half (maybe we’re wimps – haha). I bought one butternut squash, cubed it all and froze the extra, and am now making the 3rd round of this recipe tonight using the same squash! Delicious! Yay! I am so glad you enjoyed it! Do you cook the rice before adding or does it cook in the instant pot? Probably dumb question.